Name ten great things about Sheffield, please? Arctic Monkeys?, Yes. Sheffield Steel? Yes. Henderson's Relish? The Crucible, The Full Monty? Parks, pubs, trees and beer? Yes, yes, yes. Hi Pete. For anyone not familiar with your art, how would you describe it? It’s a 60 / 40 mix of every day life, and my imagination. 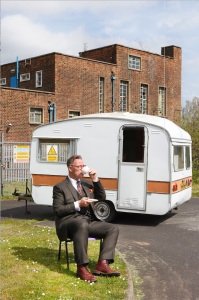 It’s my life story and growing up on a council estate in Sheffield but I’m telling stories about everybody’s lives. So there’s a lot of reference to people I know, people that I see in the street, places I walk past and shops that I used to visit. It’s every day vignettes of the world I see around me. It’s a little bit Pop Art but it’s also got a bit of a cartoon element. It’s working class art. Another key element is my passion for Music, and all the Youth Cultures I grew up with; things like Mod, then 2-Tone, the Indie scene and then Baggy. You didn’t become a successful artist overnight. How did you get to where you are now? When I left school I was convinced I was going to be a Pop Star. I was waiting for the moment when I would be playing my keyboards on Top of the Pops. Unfortunately I was still waiting five years later so I switched to Plan B, which was my art. I had to hold down other jobs, so I worked on the post for a while, and then I was five years at Tesco, picking out the orders for Home Delivery. So, I started as a cartoonist and I did that for about thirteen years at the Sheffield Telegraph but the problem was you got paid once, and then you had to hope and wait for the next commission. With commercial art, if it’s good enough, you can sell it time and again. But all those years being a cartoonist, that helped me develop the distinctive style that I suppose I’m known for today. My first exhibition was in a pub. 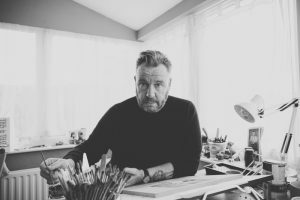 In fact, my first few exhibitions were in pubs or cafes, where you could reach ordinary people, where they would feel comfortable and where they’d have time to appreciate my work. Some artists could be described as quintessentially British, or English. Your work seems even more localised than that. Well, you take something like my Girl In The Red Coat series and it’s a flight of fancy, something conjured from my imagination, but you have to work with what you know. Even Salvador Dali, he might have had clocks and elephants in the foreground of his pictures but the background, the hills particularly, they are based on the landscape around his home in Catalonia. You once wrote, “You know you love a city when you never want to leave”. What it is that makes Sheffield so special for you? It’s hard for me to compare it to anywhere else but it’s definitely the people. They say Sheffield is the biggest small village in England. There are supposedly six degrees of separation from any other person in the world but in Sheffield it’s only two degrees. You start talking to anyone in a pub and you soon realise that you have someone or something in common. Particularly if you’re into Music, chances are that you go to the same two or three pubs so there’s a brilliant sense of community. Plus there are all the parks, and the thousands of trees; it has a certain beauty, and a certain pathos. And Sheffield is on seven hills, so you never get the same view twice. And we are on the edge of the Peak District, which Sheffield helps to manage. Is there such a thing as a “typical working day” for you? 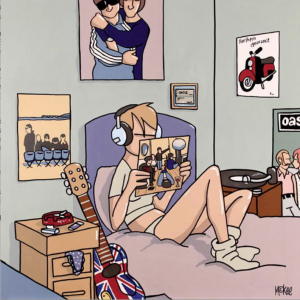 The very talented Pete McKee. If I’m preparing for an exhibition then that whole process starts about six months up front, thinking about what I want to show, how I’m going to arrange it, but I do spend a lot of time just looking around me and waiting for inspiration to strike. I’m working on a new exhibition for next year; I’m going to try to get a few other friends involved in it as well, to make the show lovely, and varied. It’s a celebration of the Working Class; I’m trying to put a bit of pride back into being Working Class. The media has lambasted it; we’re an underclass of people now and it shouldn’t be that way. There’s a lot of pressure on people to live a lifestyle that’s out of their reach, in some respects. People are encouraged to own a big flat screen TV and then they are criticised for owning one. You can’t have the best of both worlds. Obviously the concept of what it means to be Working Class is changing all the time; it’s evolving but we are the backbone of this society; without the Working Class no one gets anything done, nothing gets manufactured. We should be proud of where we come from, and of our upbringing. For some reason it’s getting a bit distorted at the moment, so I just wanted to have a celebration of what it is to be Working Class. Music plays a big part in your art. Was there a lot of music in the house when you were growing up? My dad was a steel worker, and used to play in the local pubs, but he had an accident at work and lost a finger, so when we moved house the piano got sold. He used to listen to bands like The Ink Spots, the old Doo Wop music. I have three siblings, all older than me, and I was influenced by the music they were playing. One was into stuff like Alice Cooper, Queen and Supertramp, my other brother was really into the Folk movement, whilst my sister was a fan of The Beatles and the Stones. There’s a Blood, Sweat & Tears album that I still play, and every time I hear it, it takes me back to a time and a place. Back when we grew up Social Media wasn’t invented; we just bought what was on Top Of The Pops, what you read about in the NME. Our house was basically on ‘Tick’ or what you could buy weekly from the Club catalogue books; that fashioned what your expectations were. Our TV, our hi-fi systems, our cocktail cabinet unit and bookshelves, everything we sat on was owned by somebody else, and we just paid every week for it. That’s how you did it. There are two records that I asked my brothers to get me when they were in town. One was Mott The Hoople “Roll Away The Stone” and the other was Sparks ‘This Town Ain’t Big Enough For The Both Of Us’. That got to Number Two in the chart. I was so disappointed because I thought just by dint of me buying a copy it would go to Number One. I love that song, though I could never understand the words. Your Great Labels In Popular Music suggests that you are a lover of vinyl? I am but I’m one of those people that had a moment when they had to sell their collection. I was probably behind with my Council Tax, or something. But recently I’ve been building it all back, bit-by-bit. I’ve got a small record deck and I’ve started replacing the old copies but it’s a lot more expensive this time round. I love that tactile experience that comes with going into a record shop, escaping into this unique environment. That’s one of the reasons why I like having my own gallery. And I like being able to pick up a record and look at the sleeve. I’ve even bought albums based on the artwork alone. Can you remember the first time you were allowed to buy your own clothes? 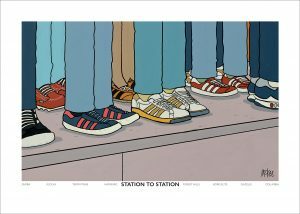 Station To Station by Pete McKee. New for 2017. Because my Mum passed away when I was about six, my Dad bought me up, and when it came to clothes purchases I relied on him. When the Mod movement came along and everyone was walking around in military Parkas, I asked my Dad to get me a Parka, and he came back with one from C&A. I was already classed as a ‘Plastic Mod’ and no matter what genre you’re into, you don’t want the C&A version of something that everyone else is wearing. So, that was the first part of my upbringing, getting it slightly wrong cause I relied on my poor Dad to get me these things. Then eventually I saw this one jacket - it was like a stud button up, with the different coloured sleeves. The Jam were wearing something similar about this time, I think it’s round about when ‘Start’ came out. And I saw one in a shop window and I just begged my Dad, “Can I get this for my Christmas present?” I remember that as my first proper choice; it was an expensive item but it was the “one thing” that I want; that treasured thing. When you’re into a music culture, or into a fashion culture, you’ve got one of two options; you either buy one item that’s THE thing, and you wear that to death. Or you’re fortunate enough to have enough money to buy several. And I was definitely in the bracket that buys one; has one certain look, one uniform, and wears it to death because I’d got no option. I had one pair of jeans that I’d wear all week, this one jacket, and this one pair of shoes, and I wore to death because that’s all I could afford. Youth cults, or music movements figure large in your artwork. Why is that? What I loved about Music fashion growing up was the codes, the dress codes. Whether it was the Mod movement, the Skinhead movement, the Suedehead movement, anything, even the Metal Heads, walking around at school with Rainbow embroidered on the back of their jacket, they had to be the right denim jacket. It was either Wrangler, or Levis or Lee but if you got the wrong one you were a fake. So, I love dress codes. 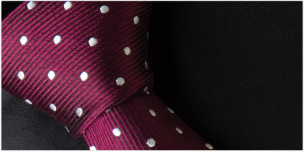 Do you have your own particular style now? A sort of Fifties look, in some respects. My hair’s been in kind of a quiff thing since I was twenty four, when I saw Edwyn Collins third album, and I thought, “That’s a smart move, that”. I’ve worn a quiff of some kind ever since really. I like that kind of style, an “American-esque” look. I like the Harrington style jackets but with a bit more of a shirt sort of collar. How did your fondness for Tootal come about? Pete McKee: Enjoying the spoils of his hard won success. I remember the famous ‘Mods’ book, the black and white one by Richard Barnes, we got that as kids, or one of us had it and the rest of us all kept looking at it. 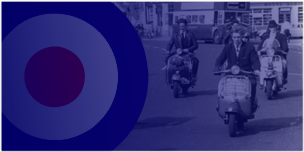 That was our dress code bible; what was acceptable to wear as Mods. I remember this one photo where some kids are dancing in a nightclub, and one kid has got a scarf tucked into his crew neck sweater. And I thought, wow, that’s a look; I’m going to look out for that. My brother-in-law used to be a Mod, and still had this Tootal from the Sixties in his wardrobe; I remember it cause he used to wear it to work. 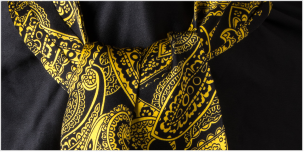 And he gave it to me; a Mustard Paisley Tootal. 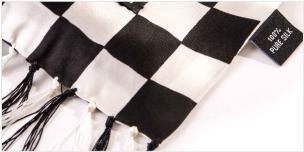 So I was the first kid, and only kid, to wear a Tootal scarf in our school. Since then I rarely had one off me neck. 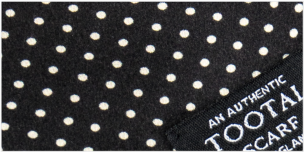 And that founded my desire, and love and passion for Tootal scarves. You have collaborated with Clark’s Shoes on Desert Boots, and projects with Paul Smith. 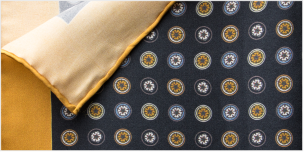 Any plans for a range of scarves? Only if Tootal ask me. I’d love to do something for Tootal. 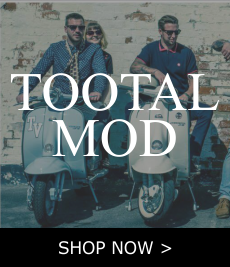 I do love a good brand association, particularly brands with class and cache and coolness; I’d love to be able to work with Tootal at some point in my life. And if you’re lucky enough to find yourself in Sheffield (once voted Happiest City In The U.K.) Pete’s gallery, A Month Of Sundays, is at 365 Sharrow Vale Road, Sheffield, S11 8ZG. This entry was posted in Celebrity & Guest and tagged Art, Pete McKee, Sheffield, Clarks, Paul Smith, A Month Of Sundays, Best Of Sheff, 6 Weeks To Eternity, Thud Crackle Pop on November 22, 2017 by Michael Mulligan.